Sweet, feminine gestures and a compelling rhythm characterize this dance selection. In this playful piece from the Khorezm region of Uzbekistan, the dancers wear bells on their wrists to emphasize the rhythmic movements of their hands. its odor doth the spirit please. Inspired by the Sufi ritual of zikr, or remembrance, this choreography draws on gestures from many different cultures of the East which reflect the heart's innermost yearnings. It also depicts the plight of millions of women who, unseen, have no political voice. ''The river is flooding,'' says the singer, referring to his overflowing emotions. He praises the beauty of his beloved and imagines her in a colorful silk dress. The style of the piece is in the lyrical Ferghana Uzbek genre. Throughout the lands traversed by the Silk Road, poetry is an honored and revered art. When verses are set to music, the dancer must embody the inner sentiments. For this setting of a Hafez poem, the costuming and dance vocabulary are unique to Bukhara, matching the compelling rhythm patterns of the introduction and the rolling 6/8 cadence of the song itself. In Bukharan dance, the performer often enters veiled, wearing a characteristic headdress called a peshanaband. 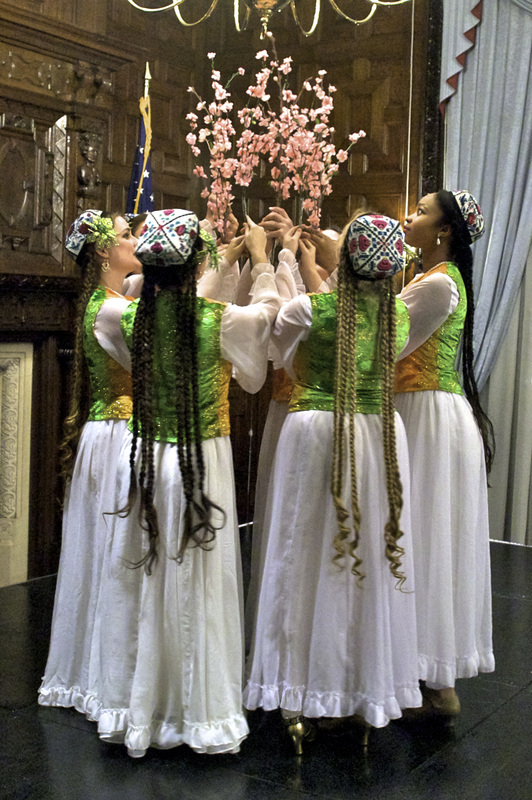 A modern classic in the Uzbek dance repertoire, Guldasta means ''a bouquet of flowers.'' It typifies the demanding Bukharan style with acrobatic elements and dazzling spins. This choreography is part of Silk Road Dance Company's Legacy Repertoire. Dancers accent their movements in this playful Bukharan folklore piece by striking saucers with finger thimbles. Costume Design based on Bakhor Ensemble. Munojat is a lament to God. It is also the title of poem by the 15th century poet, Alisher Navoi. The dance itself, set to classical Uzbek music, can be interpreted on two levels. One is the story of a young woman who is forbidden to marry the man she loves. She prays for deliverance form this situation and, in her despair, hallucinates, thinking she sees her beloved before her. She dances joyously only to realize that the apparition is an illusion. On a spiritual plane, Munadzhat is an allegory symbolizing the soul’s yearning for union with the Divine. This charming piece, performed to the rhythm of the Uzbek frame drum (doire), depicts the work of women who create silk. First, they feed the silkworms tender mulberry leaves. Later they spin thread, weave fabric, and embroider scarves. Choreography: Tamara Khanum, People’s Artist of the USSR, and Ustad Olim. Even as winter approaches, the promise of rebirth and renewal awaits in the spring. In Tajikistan, wild tulips cover the hillsides in spring and the word ''lola,'' meaning tulip, is a popular girl's name. 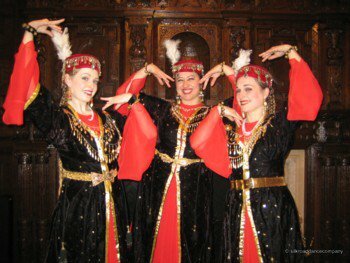 This dance was inspired by Tajik dancers who worked with Silk Road Dance Company in Samarkand in 2005. We offer it as a joyous gift of hope. Photo courtesy of Philadelphia Museum of Art. 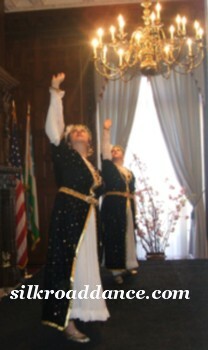 This dance is based on the famous signature piece of Uzbekistan’s “Bakhor” Ensemble. Originally choreographed for 25 dancers, this opening choreography celebrates the beauty of Spring. The Turkmen people maintain a proud nomadic heritage and a superior repution as horse breeders and artisans. Their carpets, metalwork, and embroidered garments have long been prized by collectors world-wide. Here two groups of girls meet and show off their weaving skills, lovely long braids, and glittering jewlery; many of the dance movements are drawn from daily gestures of nomadic life, including playing music, weaving, spinning yarn, and weaving.